The Spectra� Film Gate Photometer II offered by Spectra Cine is a significant advance in the field of photometry. It is extremely sensitive and solid state throughout. Reads directly in printer steps of 0.025 log exposure units. The large, uncrowded scale has an 80 printer point range and affords ease and accuracy in reading. 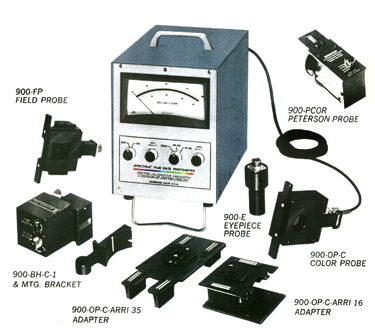 A variety of probes are available for use in Acme optical printers, Bell & Howell Model "C", "J", and "A" contact printers, ARRI printers and Oxberry printers. Other special film gate and eyepiece probes available upon request. A Photometric System for Measuring Exposure Level and Uniformity in continuous Color Printers. SCALE: Graduated in 40 uniform steps, each step representing an intensity change equivalent to a printer point (0.025 log exposure units). SCALE RANGES: Two ranges, 0 to 40 and 40 to 80 printer points, covering an illuminance range of 100 to 1. SENSOR: selected silicon cell for high stability and repeatability. SPECTRAL SENSITIVITY: Accurately matched to that of typical color print stocks. METER: Taut-band type micro ammeter. SIZE: 12" long - 9" high - 7" wide. Storage area for probes built-in. 900-OP-C Color Probe. Providing a means for precisely checking and controlling the color balance and exposure level of optical printers. Readings are made through primaries red, green, blue as well as white light. Read directly at film gate, in printer points. 900-BH-C-1 Color and Scanning Probe. This probe measures average irradiance through red, green and blue filters, and also a "white light" with out any filter. The same probe also measures the illumination uniformity in ten increments across the slit of a 35 mm printer; the illumination uniformity may also be checked through any of the colored filters in order to isolate "color wedging". 900-BH-C-2 Continuous Color Probe. This probe identical to the Model 900-BH-C-1 probe except that the scanning feature has been omitted. The 900-FP Scanning Probe for step printers consist of a separate precision slide for both the "X" and "Y" directions, each with 25 positive detents, enabling measurement of illumination uniformity in 25 independent positions of the 35 mm aperture. The 900-E Eyepiece Probe is available for monitoring the light level at the reflex viewing eyepiece position of step printers without requiring removal of film from the printer gate.